Owing the colossal popularity of the premium V belt, we are in India present the unrivalled range of the premium V belts pulley. 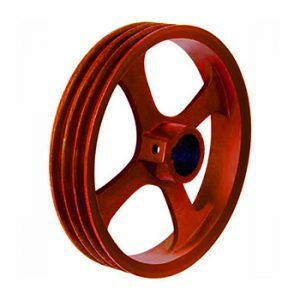 This pulley is designed to empower the performance of the premium V belt pulley, which is renowned for its high impact strength and load carrying power. The ingenious design and the concentrated manufacturing make this premium V belts pulleys a reliable option to be used with the premium V belts pulley. We can engineer these premium V belts pulleys for raw edge cogged V belts as well as wedge belts in any size requirement and deliver at any nook of India at the lowest possible prices.